Powerful cleaning action removes the heaviest industrial soil. Cuts through grease, oil and grime - ideal for engineering and plant cleaning. Cotrolled foam for scrubbing and wall washing and pressure washing. Highly concentrated and economical in use. 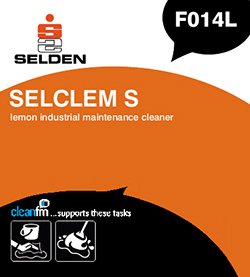 Selclem S is the ideal cleaner concentrate for: Transport, garages, service stations, haulage contractors, railways, dockyards. Engineering industries, manufacturing plants, janitorial trade, local authorities etc. Mop, spray, scrub or pressure wash as necessary. Dilutions: 1 part to 10 parts hot water for heavy duty grease, fat and wax removal. 1 part to 50 parts hot or cold water for pressure washing. 1 part to 100 parts water for light duty cleaning, damp mopping etc. Always rinse off with clean water after cleaning to remove any residue. N.B. For Aluminium cleaning Selclem S must be diluted to 1-10 or above.